There was a time when I didn't really like eggplant. Then I found out that you have to use salt first to get the slightly bitter taste out, and that changed my mind about this vegetable. This recipe takes a little time to make, because the eggplants have to soak in salt water first. Then you fry them, which also takes some time. 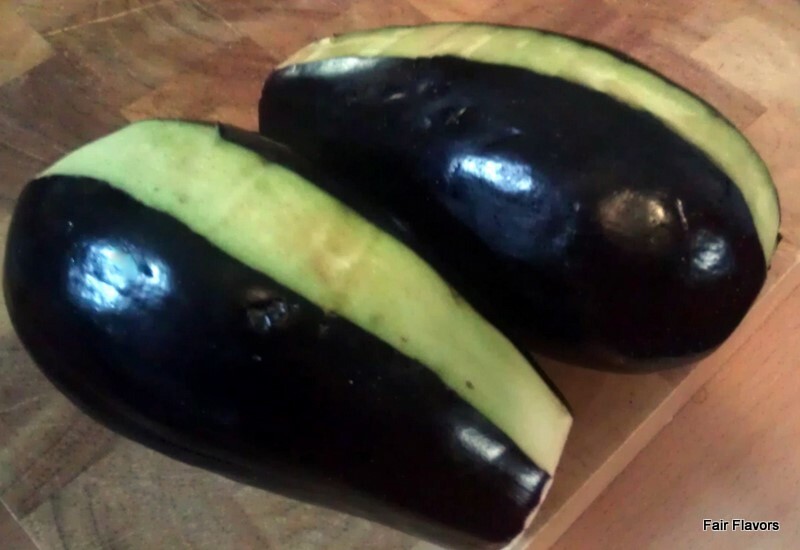 The good news is, that you can easily prepare the eggplants ahead, and then finish the dish quick and easy when you want it for dinner on a busy workday. Start about 1 inch (2,5 cm) from the end and cut until about 1 inch from the other. Don't cut all the way to the bottom (then it won't be a pocket anymore of course). 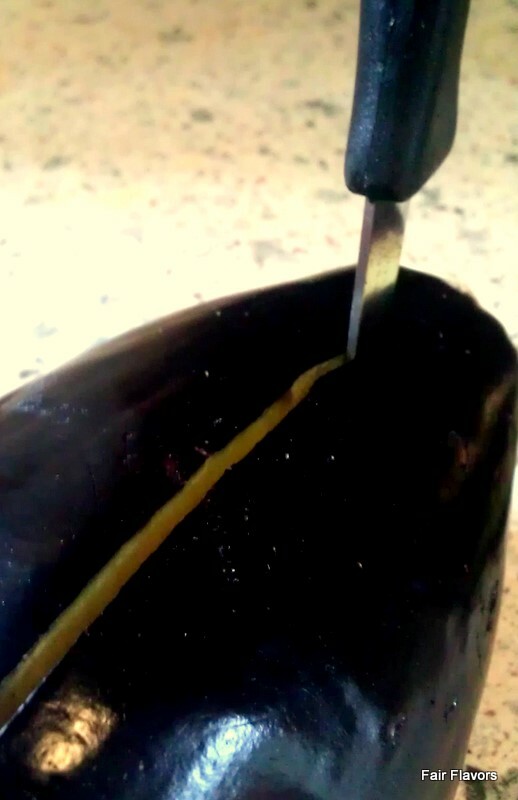 It won't look like much of a pocket when the eggplant is raw, but once it's cooked, it opens up. Now, it's time for the soaking. Put about 2 tablespoons of salt in a quart of water and place the eggplants in the water. Put a lid or a plate on top (maybe with something heavy on it), to hold the eggplants under water. Soak them for about an hour. Rinse them under running water and dry well. Heat a good amount of your favorite fat in a pan that you can cover with a lid (like a Dutch oven). Fry the eggplants on high heat quickly on all sides. Lower heat to very low, and let them cook very (very!) gently, turning them every now and then and making sure they don't stick to the pan. While they cook slowly, they will release a lot of liquid, so you don't have to add water to the fat. 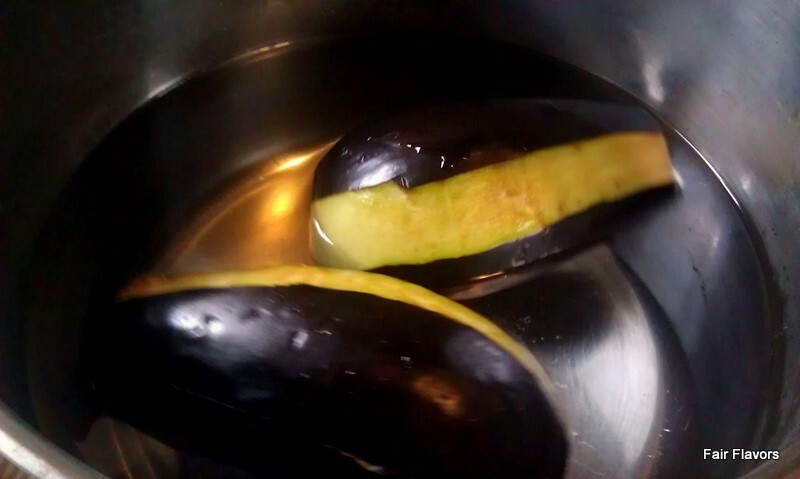 The cooking of the eggplants takes about 45 minutes. By then, they're soft, nice and greasy. They have opened up sufficiently to fill them. All the eggplant preparing described so far, you can easily do a day ahead. Put the fried eggplants in the fridge and stuff them the next day and bake them in the oven. Preheat the oven at 400F (200C). Heat some fat in a skillet and fry the meat until brown. Add the garlic, onion and pepper and fry for about 5 minutes on medium heat. Add the tomatoes, oregano, salt and pepper. Cook for 2 more minutes. Add the cinnamon and stir that in. Turn of heat. 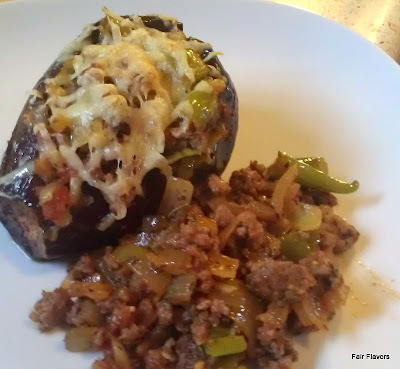 Take a spoon and stuff the soft and cooked eggplants with the meat mixture. Put a little fat in an oven proof dish and place the eggplants in it. If you have too much meat to stuff into the eggplants, just put the excess meat in the oven dish as well. If you want, you can grate some (aged) cheese on top. Put the dish in the oven for 15 minutes. If the eggplants were just taken out of the fridge (or really cold), add about 10 minutes to the cooking time. This looks yummy! Eggplant always feels like such a nice food to eat this time of year and the way you made it looks so good!